"It is said that generations separate and define us." In Marquette terms--and maybe this is unique to MU--generational breaks are determined by school nicknames or basketball coach tenures of our college youth. Like in history, the most influential Marquette generations seem to skip over transitional ones sandwiched in between. For all practical purposes, the two most dominant Marquette generations are the McGuires and the Creans, roughly lining up with the Baby Boomers vs. the Gen X’ers—or the Warriors vs. the Golden Eagles. These are the bridges that connect us. As I deplaned, the late November weather in Kansas City was in the unseasonably hot 80°s, warming up the excited anticipation of the first big basketball games of the season. Like the weather, the young promise of Marquette’s nationally ranked back-to-back recruiting classes under a young Buzz Williams was about to be revealed against three top ranked teams, including the defending national champion powerhouse. Unbeknownst to me prior, Kansas City is coined The City of Fountains, with only Rome having more. Symbolically, this trip’s theme was to become the Fountain of Youth. Looking back, I was the most unplanned on this trip. I had researched the entertainment areas and the College Basketball Experience on the internet. I knew about the BBQ and Jazz heritage. 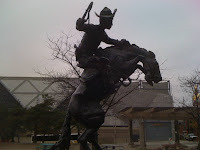 The Marquette Alumni Club of Kansas City was communicating the many events they had arranged. But, I wasn’t too organized as I had been very work-stressed in the weeks leading up to Thanksgiving. I had just wanted to escape for this trip, to just let events come to me—and they did. After I settled into my hotel room, I headed down to the lobby. Dressed in my Warrior gear, I piled off the hotel elevator and took two steps only to be greeted by a “MU, Rah, Rah” serenade by a cane-wielding octogenarian from Arkansas. She stopped me and introduced herself and told me her Marquette story after she called over her son, who was trying to secure a table at the hotel restaurant. Her and her now deceased husband met at Marquette. They attended the 1977 Sweet 16 and Elite 8 wins in Oklahoma City. She still has a hanging photograph of them with Al and Pat McGuire after the Wake Forest win. Her children went to Marquette. 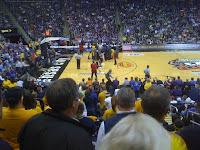 They were excited to drive up from Arkansas to Kansas City as Marquette does not play too many games in the region. As concerned sons do, he was trying to hurry his elderly mom along to lunch so she could sit down and get settled, so we parted ways. I could have listened to her sweet Marquette stories all day…and she could have told them. 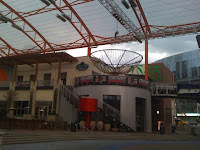 I took a short walk to and through the Kansas City Power & Light District. 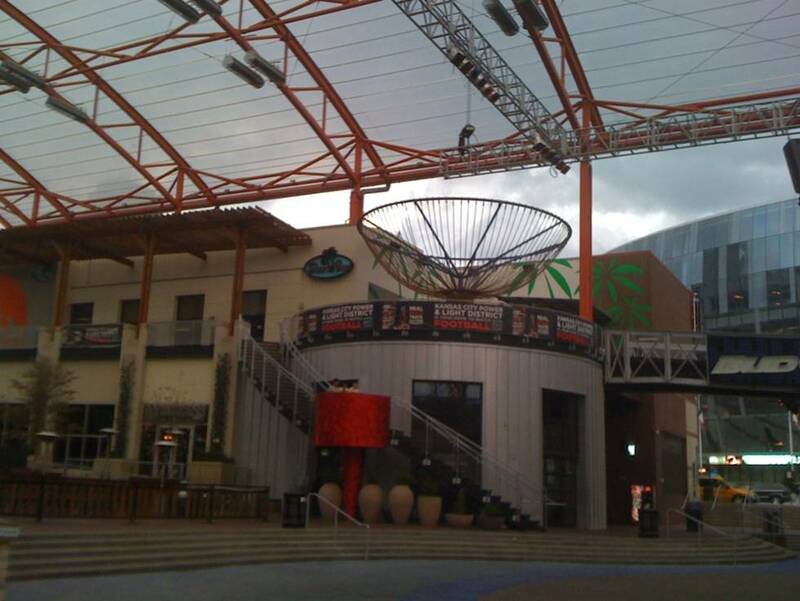 This is a great entertainment area that has been developed to include restaurants, bars, theaters, an outdoor events pavilion, bowling, and shopping, and borders the Sprint Center and the adjoining CBE. The Marquette Alumni Club was sponsoring a gathering at Johnny’s Tavern, and then all were heading across the street to cheer on the team and attendees on the red carpet for the CBE Hall of Fame induction ceremony. The Golden Eagles were the last team to arrive, and MU had the only partisan fans cheering on the red carpet. The Club did a fantastic job arranging events throughout the tournament, and they were very welcoming in a Midwestern way. I was impressed with how active the club is, with a great mix of members. Then, it was back to the hotel for some dinner and sleep. First up for Day 2 was the CBE. This hands-on museum was designed for the hard-core hoops fan. There was an arena-full of interesting exhibits, films and interactive displays. After the three point shooting contest, the free throw pop-a-shot, the passing drill, the dunk machine, and the Windex rebounding activities, I was panting like an Iditarod husky. Thank goodness the skinny jeans were left in the closet. The Gallery of Honor was especially well done. Oddly, no Marquette players are members. However, coaches McGuire, Hickey, and as of the previous night, Winter, are all enshrined. More Marquette generations. Exhausted from the pay-for-play workout, I headed to the Power & Light to grab some lunch and brew. The local Kansas City craft beer of choice is Boulevard. After a golden one (or two) and burger for lunch, I headed back to the hotel to pick-up my tickets from Marquette Athletics and catch up on some work. Johnny’s was again the Warrior meeting place of choice for the pre-game, and the turnout was very solid. Because school was still in session for students and families with young children, this trip was almost exclusively empty-nester McGuires and Creans. Johnny’s was well-stocked with Miller products in preparation, and the MU Faithful were ready to talk basketball. I met some Creans, in from all waypoints, who were using the CBE tournament as a reunion. I also mingled with some empty-nester McGuires, mostly in from Milwaukee. What I found interesting about the McGuires was that each came with their spouse, about half of whom attended Marquette as well. MU had traveled well. As the game approached, I marched across the street anxious to see the Warriors take on the Dookies in their first big test of the season. 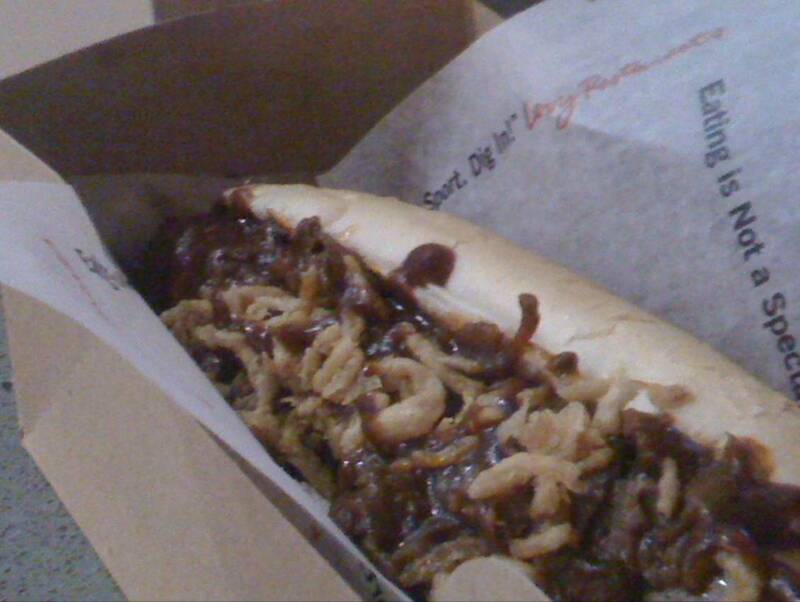 My first stop was a BBQ stand inside the Sprint Center, where I secured a BBQ dog. This was a whole lot of good on a bun, and it took some utensils to eat, I must confess. I have come to the conclusion that this town would do BBQ with morning eggs. I grabbed a beer and headed to my seat to watch the game in an arena that was about 85% Kansas State fans from nearby Manhattan, KS. Going against the defending national champions, the neophyte Warriors fell behind at half, only to climb back into it in the 2nd behind Davante “Coach K Has No Answer” Gardner. MU looked good, but the first half and Duke’s insiders beat us in the end. In the other game, the hometowners beat the Zags handily to set-up the winners’ match-up the locals wanted badly. The losers’ bracket would turn into “The Battle of the Jesuits” as a result. On hand to see Buzz: Tyshawn Taylor. Between and after games, I floated between the Creans, the McGuires and the Athletics Department telling and reveling in stories at the back of the arena high tops. The common theme: Miller Lite, and generally, the sense was that MU’s youth stacked up well to the #1 team in the land, and fans were feeling the confidence creep in from generations past. After I shaved my tongue the next morning, I headed down to the Blue & Gold Fund Brunch at the team hotel. This donor group was mostly McGuires. I was amazed to learn that many did not even attend Marquette, but they fell madly in love with Al and Marquette basketball along the way. Their lives are all about Marquette, its values and traditions, and all have donated in big ways to support student-athletes, not asking much in return—and all behind the scenes. These are the unsung heroes of Marquette athletics. More so, some only graduated high school, yet have sent a couple of generations of their offspring to the hilltop in Milwaukee. Very inspiring, but this brought home how much Al was loved and what he meant to Marquette. The Marquette Generation Mixer again continued later in the afternoon at Johnny’s before the Zags game. This time I hung more with the Creans. Between the two, both generations love Marquette basketball, and both are equally impressed with the other. DWade, Butch, Dean, DJ, George, Wes, Bo, Jerel—the stories never end. Being one of the few of the “in-betweeners” there, I could bridge the generations with perspective: Both successful basketball coaching regimes were matched by successful terms of university presidents. In between, identities and generations were lost. 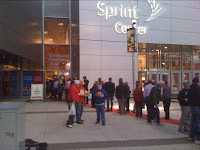 I headed back to the Sprint Center for the evening’s match-ups and with a hopeful MU outlook. However, Buzz’s inexperienced team was flat and Gonzaga edged MU out in another close one. Duke then blew out Kansas State, which left MU with the two closest games in Kansas City, yet with the most losses--a theme that would permeate the season. Jimmy Butler was named to the All CBE team. However, Marquetters now left Kansas City unsure and wary of the team’s youthful identity—yet most were also hopeful of the promise of the Buzz Generation to come. Thanks for the props for the Marquette Club of Kansas City, Tim. We were proud to welcome the many MU fans and alumni who came to town. 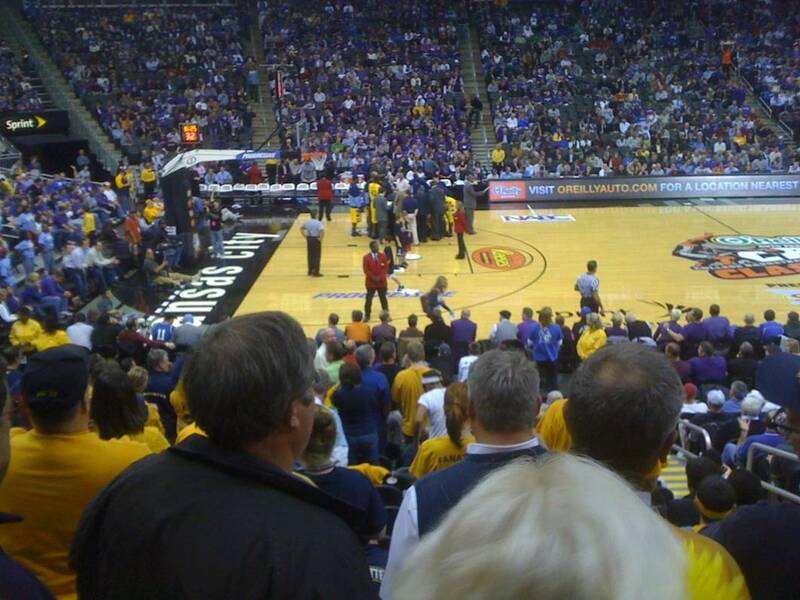 We hope Marquette returns to the CBE in the future so we can do it again!